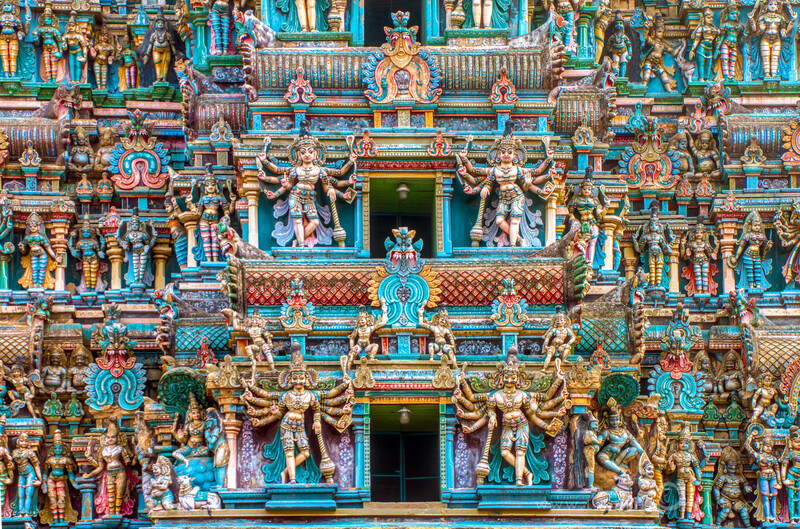 This shot is just part of the base 2 tiers of the 9 tier Merku Gopuram (west tower) of Meenakshi Amman Temple, Madurai. The temple complex spanning 14 acers – has 4 nine-storey gopurams (outer, raja), 1 seven-storey gopuram (Chittirai), 5 five-storey gopurams, 2 three-storey, and 2 one-storey gold-gilded sanctum towers. Each one compete and excel at being more intricate and detailed as the other. Though there are references to Meenakshi Amman temple in literature going back to 6th century, these were restored back to its pristine glory in the 16th century, when King Thirumalai Naicker came back to power in Madurai. What awe-inspiring structures, with-standing the test of time. With such intricate work, would you believe this was conceived and constructed centuries ago ?!!! Lovely! The details are insane! True Kelley … I am always awe-stuck with the intricate details and symmetry in such ancient work !